Score 1 for Health remains one of KCUMB’s most important and far-reaching programs. Score 1 provides free, in-school health screenings, preventive health education and health-care mentors for children in areas of greatest need, including those in urban core, underprivileged and low-income families. The program has addressed disparities in access to health care for children and families in the Kansas City metropolitan area for more than 20 years and builds on the idea that optimal health and well being enhances the ability to learn, grow and develop creatively. 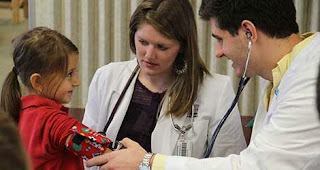 KCUMB’s first- and second-year osteopathic medical students participate in health screening days, gaining valuable clinical experience in pediatric health assessment while providing an important community service. The program screened children in 50 schools within the Kansas City, Mo., Raytown, Center, Hickman Mills and Kansas City, Kan., school districts, as well as at several charter and Catholic grade schools. During seven screening days, Score 1 assessed 12,227 children and conducted more than 18,000 screenings. Score 1 nurses followed up with more than 3,000 families to discuss referrals for children who required additional care. I invite you to consider volunteering to assist with Score 1 health screenings, alongside KCUMB students, faculty and staff. If you are a physician or health-care professional and have a desire to make a difference, contact Annette Campbell, director of Score 1 for Health, at 800-234-4847 ext. 7962.